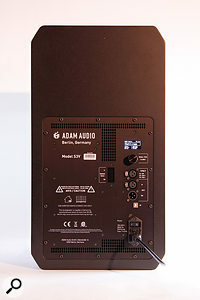 Germany’s ADAM Audio, founded in 1999, will be more than familiar to regular readers of SOS, as several of the company’s products have taken top spot in the Studio Monitor category of the annual SOS Awards in five of the last seven years. ADAM Audio’s monitors and their success have been built around the company’s proprietary X‑ART (eXtended Accelerating Ribbon Technology) folded-ribbon tweeter, itself a further development of the Air Motion Transformer invented in the 1960s by Oskar Heil. Never a company to rest on their laurels, ADAM Audio have continued to develop their products and the latest iteration of the X‑ART tweeter, the S‑ART, now makes its debut in the company’s newly redesigned S Series range of active studio monitors. 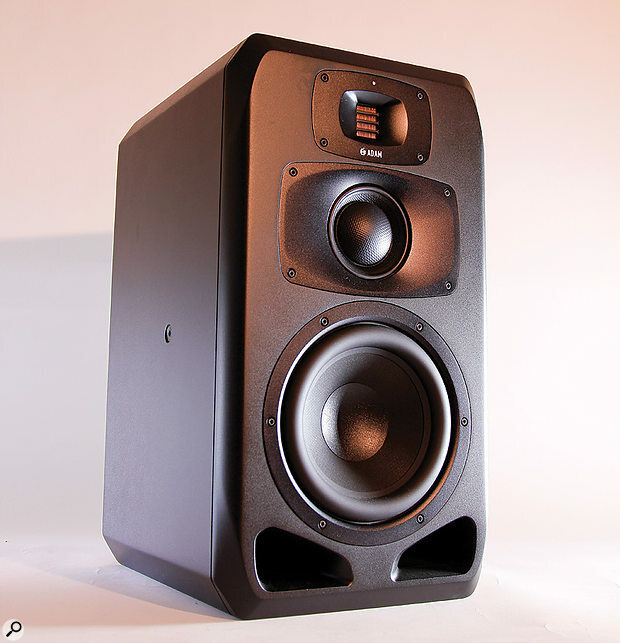 This third-generation S Series consists of five models — one two-way and four three-way speakers — three of which (the two-way S2V, the S3V reviewed here and the S5V) are designed to stand upright in the vertical plane, whilst the remaining two (the S3H and S5H) recline horizontally. 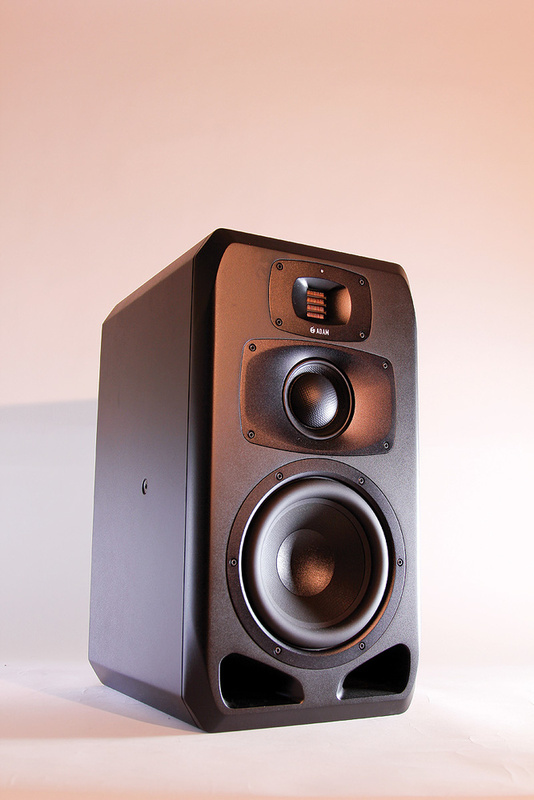 The S3V is a three-way, vertically oriented studio monitor designed primarily for midfield applications (which implies a sizable listening space), although ADAM do state that it can be used successfully in more compact environments. Physically, the S3V is quite an imposing object, being 536mm tall and weighing in at 25kg. The S3V’s weighty, all-black enclosure incorporates mounting points and is constructed from a vibration-resistant material to reduce resonance and coloration, with large-radius edges employed to minimise edge‑-diffraction effects. Aerodynamically, the cabinet’s front-ported bass reflex system has been redesigned to reduce air friction and turbulence, whilst its twin ports now incorporate additional anti-resonance technology in order to minimise coloration. The rear panel carries the monitor’s connectors — a balanced XLR analogue audio input, two XLRs for AES3 digital audio and loop-through, plus a USB socket that gives the user remote control of the S3V’s onboard DSP via ADAM’s free S Control software. Finally, a small blanked-off panel conceals the promise of a forthcoming network option. Sitting above the audio connectors, a push‑to‑select rotary encoder and a small OLED screen give control access to ADAM’s new, proprietary onboard DSP engine, which handles crossover/amplification/driver optimisation and provides five ‘room tuning’ equalisation memories, two of which are factory presets. In addition, the DSP also takes care of driver protection and processes the AES3 digital audio signals. The S3V’s front panel carries the new high-frequency waveguide and the all-new tri-amped driver complement: 500W RMS Class-D for the bass, 300W Class-D for the mid-range and an ADAM-designed 50W, 300kHz-bandwidth Class-A/B analogue amplifier for the treble. Crossover points are set at 250Hz and 3kHz and, according to its published specification, the S3V delivers a frequency response of 32Hz to 50kHz, a THD (above 100Hz) of 0.4 percent, and a maximum SPL (per pair at 1m) of greater than 124dB. In order to improve on the X-ART’s already impressive high-frequency performance, the S3V’s S‑ART tweeter (also hand-made in the ADAM factory in Berlin) is built using a higher-precision manufacturing process, followed by a more stringent post-factory testing regime. The S‑ART tweeter is mounted in ADAM’s new High-frequency Propagation System (HPS) waveguide, a solid block of milled aluminium designed to achieve an even, consistent dispersion that is wide in the horizontal plane and tightly controlled in the vertical plane. The dispersion pattern from this new waveguide is not only intended to minimise reflections from horizontal surfaces in front of the listening position (mixing consoles, for example), but also to create a wide, well-controlled sweet spot, even at high monitor levels. The monitor’s Dome Cone Hybrid (DCH) mid-range driver is a new ADAM in-house design and is, as its name implies, a part-dome, part-cone hybrid. The extremely rigid, one-piece, laminated carbon-composite diaphragm has a specially formulated foam surround and behaves as a piston up to 8kHz (1.5 octaves above its nominal operational frequency range), and its low-frequency response extends down to 200Hz. The DCH driver is designed to combine the clean decay and linear frequency response characteristics of a dome driver with the high-excursion advantages of a cone driver, with the aim of delivering a transparent, uncoloured mid-range, even at high listening levels. The DCH driver sits in its own individual waveguide, again designed to deliver a horizontally wide and vertically constrained consistent dispersion that also contributes to the existence of a wide, well-controlled sweet spot. The physical dimensions of the new waveguides have allowed ADAM to position the DCH driver closer to the S‑ART tweeter, thus enabling the pairing to act as a more coherent source of mid-range audio information, again with the aim of helping make dispersion in this critical frequency area more consistent, more accurate and wider. Anchoring the bottom of the S3V cabinet is yet another new development from ADAM Audio’s engineering team, the Extended Linear Excursion (ELE) bass driver that was created specifically for the new S Series bass reflex system, with its development running in parallel with that of the cabinet. Structurally, the S3V’s ELE bass driver combines a new light, internally damped and extremely rigid ‘hexacomb’ cone with a chassis designed to eliminate unwanted resonance and distortion. A new, highly resilient, long-throw speaker surround allows large cone excursions in either direction and a highly tensioned linear suspension system dampens the cone movement in a controlled manner and returns it to its rest position. Another new development, the Symmetrical Magnet Assembly (SMA) extends the maximum possible excursion of the ELE’s voice coil by a factor of three compared to previous ADAM driver designs. An elongated pole piece extends beyond the magnet assembly to expand its magnetic field, helping to keep it symmetrical and thereby keeping the driver’s performance linear and reducing distortion to a minimum. This greatly extended travel, coupled with the long-throw speaker surround and tensioned suspension system, enables the cone to operate in a linear fashion over extremely large excursions, enabling the ELE bass driver to displace a greater volume of air in order to more accurately reproduce bass frequencies. In addition, the SMA contains a built-in ventilation system designed to prevent the ELE’s large, custom-designed voice coils from heating up, thereby reducing the negative effects of power compression (heat-related changes in coil resistance and reductions in damping and dynamic range) on driver performance. In the S3V’s ELE driver, the parabolic pole pieces of its SMA prevent unwanted modulation of the driver’s magnetic field, reducing non-linear second-order distortion, and demodulation rings help the magnetic field remain symmetrical, minimising non-linear third-order distortion. As mentioned earlier, ADAM’s new DSP engine, based on the latest generation of SHARC chips, implements crossovers optimised for the S3V’s drivers and amplification, and also handles limiter-based driver protection, the AES3 digital inputs and the upcoming connectors for future options. An OLED screen and a push-to-select rotary encoder are provided to aid menu navigation. However, since that user interface is located on the S3V’s back panel and you’ll probably want to be sitting in the monitoring position when making adjustments, the more convenient method of scrolling through the DSP, adjusting input levels, setting loudspeaker delay, managing the five EQ presets and loading new firmware into the S3V is going to be via USB and a Windows or Mac computer running the free S Control remote control software. The rear panel houses the analogue and digital audio inputs, as well as the screen and dial with which you can access and adjust the DSP options.Five onboard EQ memory locations are available on the S3V, two of which are non-editable factory presets, leaving three available for users’ own voicing or room-tuning settings. The two factory presets are Pure (flat), and UNR (Uniform Natural Response), a frequency response curve of ADAM’s own creation. The S3V’s equalisation is eight-band — high and low shelving bands plus six individual fully parametric EQs, all offering ±12dB of adjustment between 20Hz and 20kHz. Setting up the S3V produces few challenges, provided that you can position it at a minimum of 400mm away from a wall and that you can happily heft its 25kg (55lbs) into position. After running the review pair in continuously for around 12 hours on their Pure setting, I began by tuning them to my listening environment, which turned out to be a manual process, rather than anything involving microphones and automatic calibration. The S3V’s DSP is doubtless extremely powerful, effective and future-proofed. However, although working with the rear-panel OLED screen and encoder is simple enough, taking that route involves a fair amount of movement between your mix position and the rear of the S3V when making and auditioning changes across the eight EQ bands. 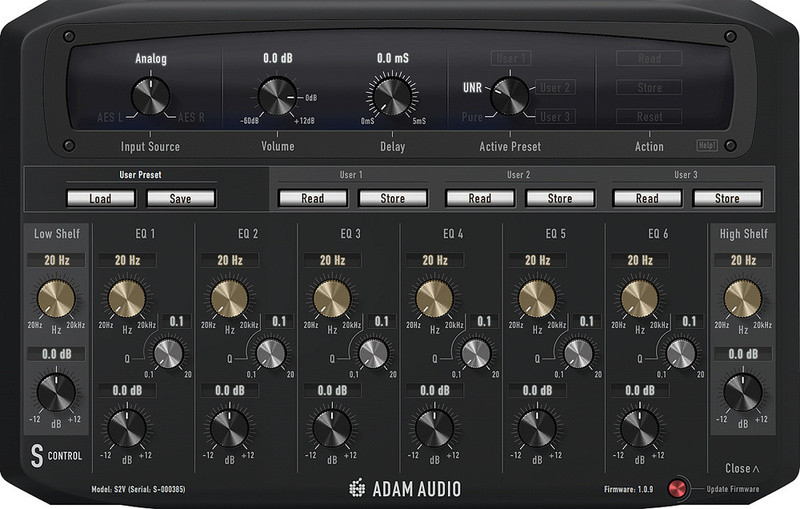 ADAM’s S Control app allows you to tweak an ADAM S Series speaker from your computer (and listening sweet spot), via USB. Much easier is to use the free S Control application, as its user interface is much more convenient and intuitive than the OLED/encoder combination. It does display a couple of inconveniences, however: before you can hear the effect of any on-screen EQ or setup change, that change has to be stored as a preset in the S3V, at which point the loudspeakers’ DSP reboots, taking approximately 15 seconds to do so. Also, at present, the S Control program can only connect to one S3V at a time, which means that you have to physically change over USB cables and restart the app. However, this process is something the vast majority of users will only ever have to do once or twice, and the software is certainly a much more convenient way of accessing the DSP than using the rear-panel controls. It has a further advantage in that it can store an unlimited number of presets in your computer, in addition to the five stored within the speaker. I also feel certain that the DSP and S Control software integration will improve with time, while the as-yet unused expansion slot may allow for more streamlined S Control integration in future. In performance terms, the S3V’s all-new driver complement produces an overall character that, to my ears, sounds distinctly more ‘modern’ than my beloved A77X. Instruments and their transients seem more sharply etched and more in focus across the entire frequency spectrum on the S3V than on the A77X. With bass-laden EDM tracks the S3V not only delivered low-frequency information extremely precisely, but also was able to keep transients on either side of the bass/mid crossover point clearly delineated, a quality that will no doubt also be appreciated by metal and rock-oriented recording studios and by producers and engineers working in classical and acoustic music. Following on from there, mid-range reproduction is simply excellent, its precise and clear delineation taking over from the bass driver and continuing seamlessly up to where the new S‑ART tweeter takes over. I am more than fond of the X-ART tweeter in my A77X, but the S‑ART appears to possess a greater degree of precision than its predecessor, a quality that integrates really well with the new DCH mid-range and ELE low-frequency drivers. Interestingly, the S‑ART tweeter also sounds to me to be more in control of the high frequencies than the X-ART, a trait that reinforces its quality of manufacture. The accuracy and subtlety of reproduction that the new drivers (and their amplification) in the S3V are capable of really comes to the fore when dealing with orchestral and operatic music, exposed acoustic instruments, drum tracks, vocal tracks and reverb tails. I was very impressed by the level of detail that the monitors delivered, a performance that showcased good recordings and left poor recordings with nowhere to hide. Personally, I aim to monitor at around 80dBA when recording or mixing and the S3V performed superbly at that level. I tried winding the review pair up to a 100dBA average and, other than being much louder than I like to work with for any length of time, nothing changed — the overall sonic performance stayed exactly the same. With the S3V positioned in the midfield, driver integration felt seamless, the phantom centre image sitting absolutely rock-solid in a wide and deep soundstage that had instruments, vocalists and their associated effects clearly positioned within it. The S‑ART and DCH drivers and their waveguides created a sweet spot that was considerably wider than that which I’ve been accustomed to, and I felt confident in what I was hearing when I moved to either side of my usual mix position. ADAM imply that the S3V can also be used more in the nearfield and, although that is certainly feasible, due to the height of its front baffle I suspect that it might take a little experimentation to find a position that would achieve the same level of driver integration as I heard in the midfield. Personally, given my experience with my own A77X (and a friendly bank manager), I would be much more likely to go with a pair S3H speakers instead for nearfield use. The S3V comes across to me as an extremely high-quality monitor designed primarily for the truly professional end of the recording, broadcast and film industries. It delivers the audio performance required of those markets and the attention to detail in its design, the quality of its construction, together with ADAM’s commitment to support, will doubtless make the S3V a competitor to be reckoned with. Given its price and the overall excellence of its audio performance, the S3V seems certain to write a new and highly successful chapter in the renaissance of ADAM Audio under the leadership of David Angress. A significant amount of investment in time, money and R&D has obviously gone into this new S Series, which bodes well for its (and ADAM Audio’s) longevity and which, I am certain, will enable professional studios — and anyone else whose livelihood depends on the performance and reliability of their monitors — to invest with confidence in the S3V and its stablemates. At the S3V’s performance and price, competitors include the likes of Focal, HEDD, Genelec, Neumann and PMC, among others. Wide sweet spot with rock-solid stereo imaging. New driver technology produces superb results. Well priced for the performance that it delivers. S Control application needs improving. 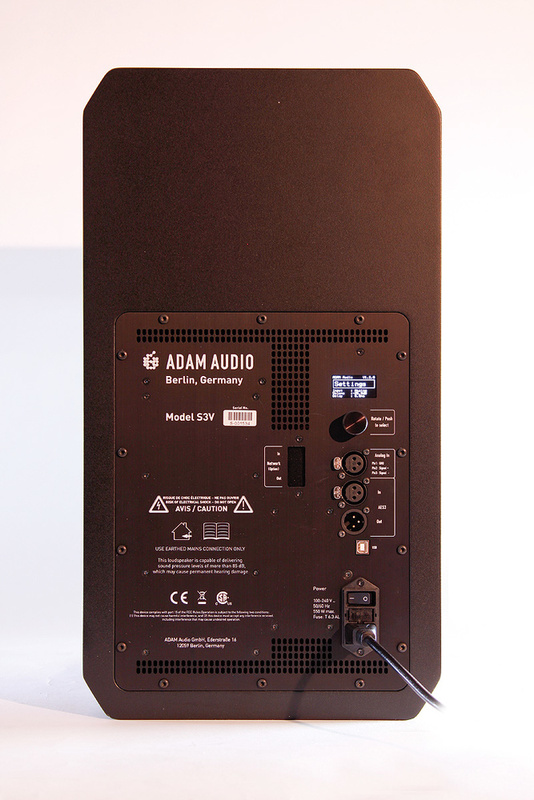 The ADAM Audio S3V is a truly professional-level monitor. Its audio performance, new driver technology and construction quality should ensure its success in those markets whose needs it is designed to satisfy. £3998 per pair including VAT.